The UK’s leading charity for children with brain injury has produced a new resource available for free to families. 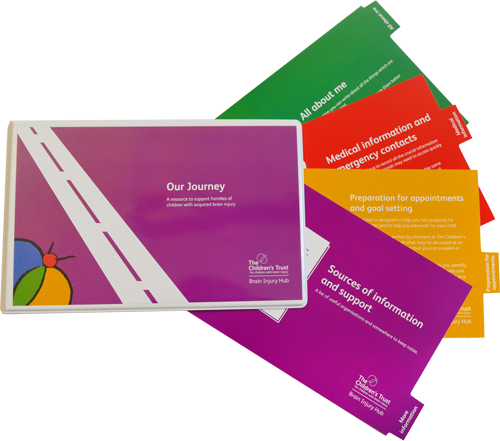 Our Journey has been designed to help parents and carers prepare for a child’s appointments, record medical information, understand therapies and support them on the ongoing journey of rehabilitation following a brain injury. The folder has been created by The Children’s Trust and has had input from expert clinicians, an experienced writing team and families. It has been charitably funded and can be ordered for free. Maria Coyle, information editor at The Children’s Trust said: “Our Journey has been entirely charitably funded so it means we can supply it to families for free. We are thrilled that through the support of our sponsors we are reaching more families throughout the UK. The charity’s Information officer, Clair Cobbold said: “Families often have a lot to take in when a child has sustained a brain injury and suddenly has endless appointments and therapy sessions. Pocket identity card: which a child can carry with them and where some details can be written about their condition, along with emergency contact details. Our Journey has been created to enable parents and carers to advocate for their child, whilst informing them and helping them in a practical way. For more information or to order Our Journey or any of the other books please visit www.braininjuryhub.co.uk/books. Be the first to comment on "Children’s charity creates tool to support families"